The eggplant has a devout group of followers, and I’m happy to count myself among them. I’ve been a fan for as long as I can remember – from the vinegar pickled ones my grandmother used to make during season, to the crispy and tangy eggplant parm I request every time I visit Mom. I love this vegetable in all its forms. 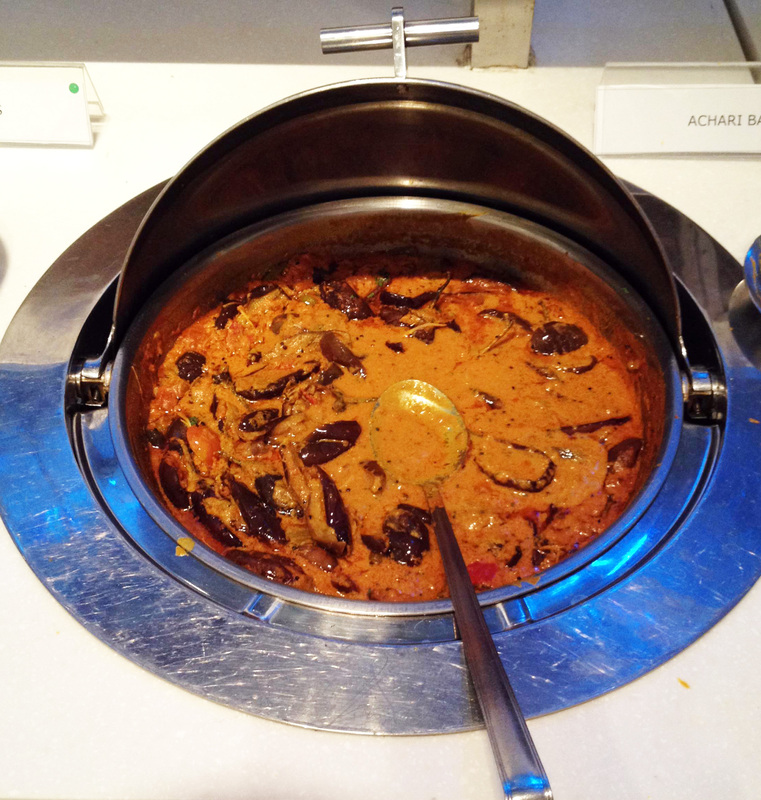 So, when on a recent trip to India I tasted Achari Baingan for the first time, I was immediately smitten. I asked to meet the chef. It turned out that meeting the chef entailed following a bit of protocol. I was, after all, at Le Meridien, New Delhi – a large, five-star luxury hotel with four restaurants, two bars, banquet hall…you get the picture. I just wanted to tell the chef how much I enjoyed his food (and maybe even get the recipe), but the restaurant manager contacted the hotel manager, who contacted the public relations manager, who, I suppose, eventually gave us the green light. Anyway. I was escorted to a brightly lit boardroom and told to wait for the chef. So much suspense. A few moments later executive chef Davinder Kumar walked in, clad in a white chef’s jacket and complete with a crisp toque – total celebrity-style. 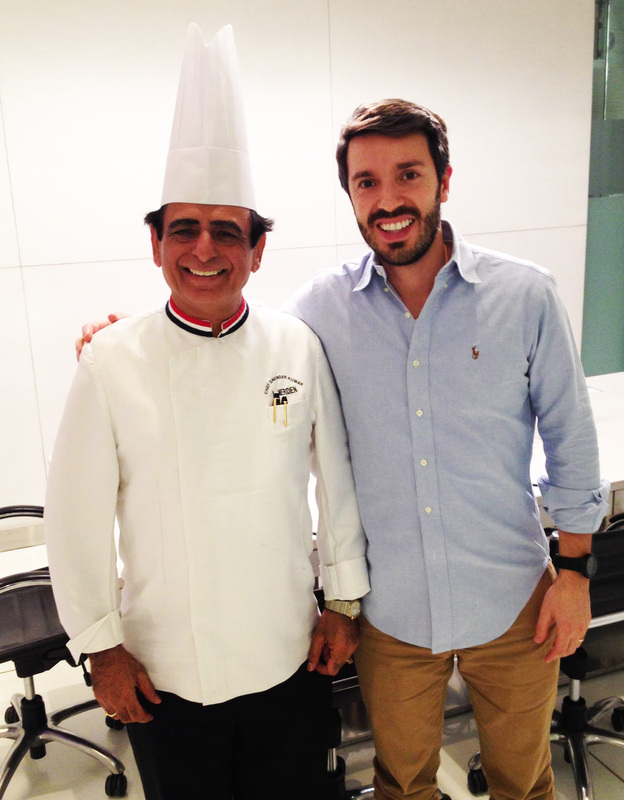 As it turns out, Davinder is a celebrity chef in India. He definitely has the credentials and street cred to be so: He studied culinary arts in Paris, has been the recipient of several awards, written four cookbooks (he’s currently at work on an encyclopedia of Indian curries), had his own cooking show on television, and has been working in kitchens for four decades. He’s VP of Food & Beverage Production and Executive Chef at Le Meridien, which is another way of saying that he runs the hotel’s 12 kitchens and a team of no fewer than 120 cooks who prepare more than 3,000 meals a day. As impressive as that sounds, Davinder is a soft-spoken, warm guy who was honored to hear that I enjoyed his food. And his passion and commitment for all things culinary is palpable. 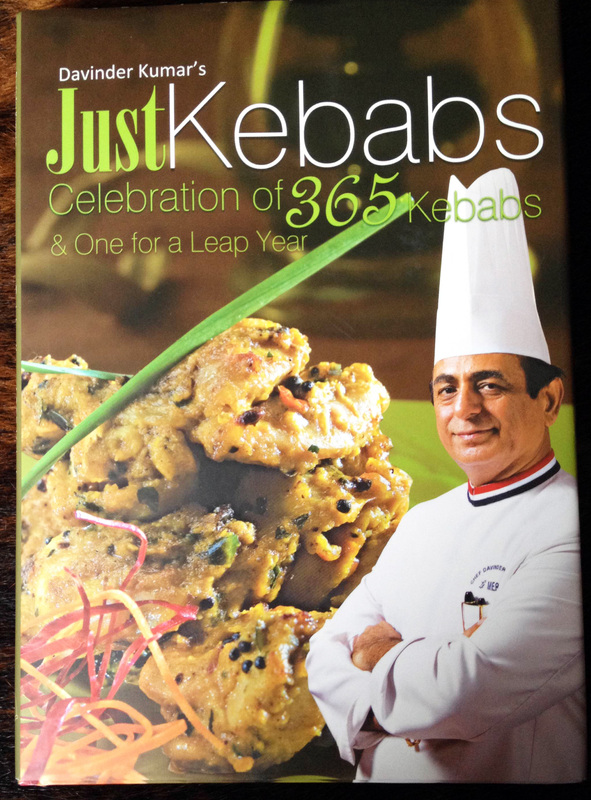 He told me that for his most recent cookbook Just Kebabs, a Celebration of 365 Kebabs & One for the Leap Year, he researched the history of – and made – thousands of different kebabs before settling on the 366 for the book. And when Greenpeace set out to make the world’s biggest organic Baingan Bharta (another delicious eggplant dish) to oppose the introduction of a 2011 bill relative to genetically modified crops in India, they called Davinder to lead the cooking – 550 pounds of eggplants made into a tasty puree. Imagine that. He developed a passion for cooking while working at a hotel kitchen in the early 70s, when cooking was not as glamorous as it is today. He also gave me a lecture in food history, explaining how India’s place in the culinary world stage has experienced a transformation in the past 20 years. “It used to be that India’s food was internationally known by curry and chicken tikka masala,” he said. “Today, regional Indian cuisines are popular.” And you don’t need to go to Queens to see he makes a good point; you can see it right here in Boston. Davinder comes from the northern region of Punjab, where the typical cuisine traces back to the time of the Mughal Empire – those guys who invaded India from the north in the early 16th century. They had personal chefs, and their recipes were passed down for generations within families of cooks. I said I’d been eating his food all week and that achari baingan was, by far, my favorite dish. He made a face. Clearly, I butchered the name, so I had to show him a picture on my phone. He smiled. “Will you teach me how to make this?” I asked, pointing at the picture on my phone. He thanked me for reaching out to him and said he needed to get going. I then realized it was Friday night and the hotel was full. I left our meeting with a smile on my face and the hope for the eggplant recipe. When I returned to my room later that evening, I found a package on my desk. It was chef Kumar’s kebabs cookbook with an inscription and autograph. That put another smile on my face. The next day, I checked my email, and there was the recipe. I couldn’t wait to get home to make the dish. Heat vegetable oil in a wok or pan and fry the eggplants till crisp. Set aside. Heat mustard oil in a wok or pan and add the achari masala (fenugreek seeds, onion seeds, carom seeds, mustard seeds, fennel seeds, whole red chili). Cook until the spices crackle. Add chopped onion and cook until golden brown. Add the onion rings, turmeric powder, yellow chili powder, salt, and yoghurt, stirring continuously in one direction until froth forms and to avoid cuddle. Add garam masala, slit green chili, chopped fresh cilantro, diced tomato. Stir well. Add the fried eggplants to the gravy and mix well, check the seasoning and arrange in a bowl. Serve hot, garnished with ginger julienne alongside rice or choice of bread. 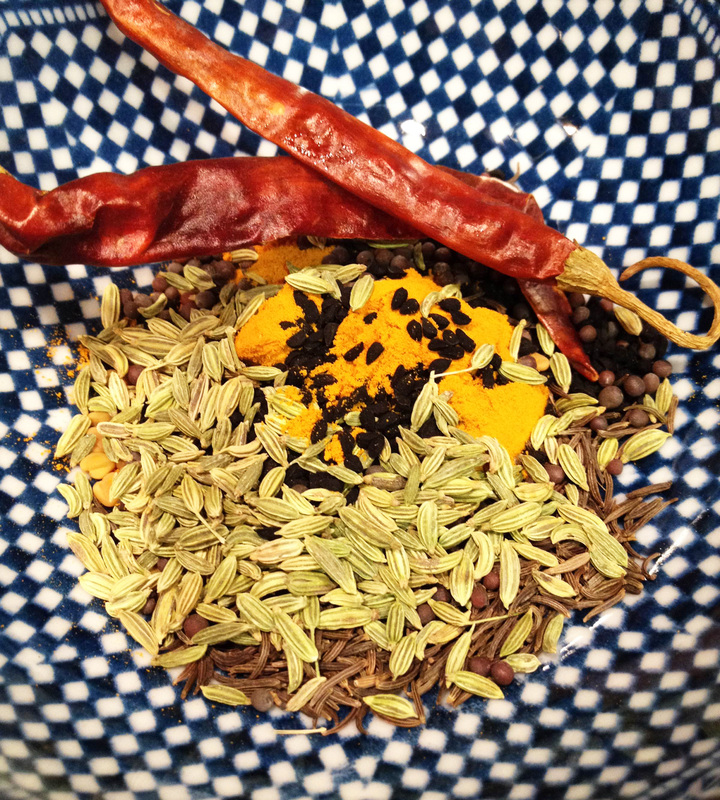 Tip: like most masalas (combination of spices) you can purchase ready-to-use mixes. I suggest you make your own achari masala by taking this list of spices to the store and purchasing them separately. If you’re into Indian food, you’ll go through them before they spoil. Otherwise, just get a box of pre-mixed achari masala and you’ll be set. Wow! Que buena gente mandarte una copia de su libro! So nice and what a great story!